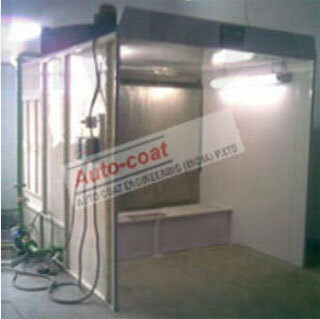 Autocoat Engineering Manufactures & supplies wide range of water wash spray booth . The generic names of water wash spray booth seem to confuse sometimes, so there are different names, but the spray booth is same. Water wash spray booths are the first kind of paint booths before the dry back booths were introduced in market. Autocoat has been in manufacturing water wash spray booth since last 35 years , which is almost from the start when such kind of technology was gaining popularity. Major advantages of water wash paint booth is that these booths are as good as maintenance free , which means there are no routine expenses like change of filter , or keeping stocks of filter for the replacement purposes. Water used in a water was spray booth can be used over and over again using latest systems like paint sludge remover etc. 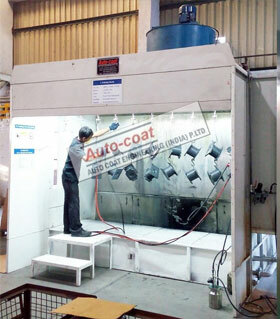 Autocoat has manufactured large number of water wash spray booths for different products and companies. Water wash spray booths are very advantageous at places where the production seems to be very high or mass production activities .Water wash paint booths are also available with special models namely water wash spray booth with water curtain , water spray booths with water screen. Autocoat Engineering with its so many years of experience , with its large number of product data have made easy selection charts ,which are very useful while selecting a right water wash paint booth for your painting activity. Depending on the paint consumptions per day or on per shift basis , either Autocoat Engineering Standard (AES models ) or AES special ( custom made models ) can be selected. All parts and components used in our system are 100% Indian made ,thus it is a Indian made spray booth. For sampling work and very less paint consumption we guide our customers to go for lab water wash p booth. We call this like the most smallest or mini model of our in house production. This is very low cost spray booth but with all features of a full sized water spray booth. This system consists of a full booth tank filled with water along with distribution plates , base plates & rows of eliminators . The blower used is of a smaller capacity but with a centrifugal suction , this kind of suction helps in powerful velocity in the paint booth . Unlikely with other competitors with lack of knowledge or low pricing give tube axial blowers which produce poor suction velocities and becoming permanent pain for life. Other areas when the water spray booth plays a major part in finishing industry is mass production Conveyorised water wash booths. In such circumstances the dry spray booth can not handle the large number of waste spray liters or paint fumes. Water wash booth contains large quantity of water which is continuously made to create tornado effect with the use of high pressure centrifugal blowers and special elements of the washing chamber . The paint rich mixture with air is been washed thoroughly before the paint leaves the extraction zone. The cyclic effect of water on paint makes it heavy and thereby depositing the paint pigments in water. Autocoat provides special booth powder for the water tank which increases the density of waste spray and takes it to the bottom of the paint tank. 3 rows of eliminators are placed in such a way in the washing chamber so that maximum paint gets deposited on the eliminator plates. Since there is no filter in the water wash booth the chocking of the booth does not happen very quickly ,the period of maintenance of the spray booth can be longer than that of dry booths. Water type spray booth selection charts for no pump design (water curtain can be added separately) In Conveyorised spray painting if the water wash paint booths are connected with paint sludge removal system ,than the hassles of removing waste paint sludge can be reduced , as the paint sludge removal system is capable of removing 1 to 2 kg of sludge at every 10 to15 minutes . These systems can be encorporated only in water wash paint booths. Autocoat designed water spray booths are normally pumpless type in nature .No pump water wash booth is the latest designed in the painting field , previously the spray booth would run on a tube axial fan and a water pump to supply water on the water screen , this method is now fully outdated as the pump chokes there by reducing the efficiency of the spray booth. Pumpless water wash design superior performance also reduces the maintenance activity of the paint booth , plus reducing stock of spares for pump & valves. Due to removal of pump from the existing water wash system , direct power saving of proportionate kilowatts is achieved.Our water type paint booths are extremely popular in industries like Automobile manufacturing , Paint shop for two wheeler , furniture painting , Plastic painting. We have supplied numerous water wash spray booths for spray painting of valve , iron casting , spray booth for engine block , electric motor painting etc and many more. Even though Pumpless water wash booth is very versatile, for very specific areas like plastic painting line , abs painting , small toys painting lines , furniture painting it is some times very necessary to have a water screen on the front side of the paint booth if the painting volumes are huge. A specific dust created by the plastic & furniture paints have a static tendency to stick on the vertical wall of the wet type booths . It becomes a sticky atmosphere in the painting zone as the layers of this paint dust increases. 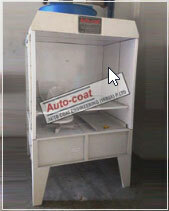 Autocoat Engineering through study on the paint dust has helped to develop water type booths with capabilities of centrifugal suction draft and addition of a water curtain to enhance quick discharge of the paint sticky dust into the paint booth water tank, thereby helping our customers a trouble free painting operation. Our wet paint booths are comprised of manual & quick fill & make up water arrangements , these make up water arrangements play an important feature during the continuous use of the spray booth . 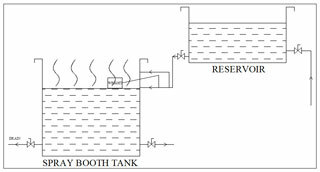 Water due constant evaporation reduces the level in tank , this can hamper the suction capacity of the waster wash booth as the water level need to be maintained constantly . Manually making up of water is not possible as per Autocoat Engineering study , that why quick fill & make up water arrangement becomes very useful feature and painter could use the paint booth without monitoring water Levels. We have constant checks and inspection of raw material at stages ,from incoming to bending ,to welding hole punching etc . Almost all of our water wash spray booth fabrication work contains punched holes & bolted construction, this technique helps us & our customers to assemble, dismantle & re assemble if the spray booth location needs to be changed. Autocoat takes serious responsibility in functioning of its each booth , by assembling, actual blower testing in our factory before any paint booth is dispatched.